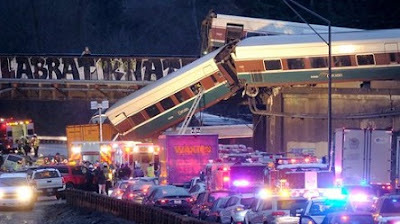 At least 'six people' have been killed after a high-speed train derailed off a bridge and onto a packed highway in Washington. 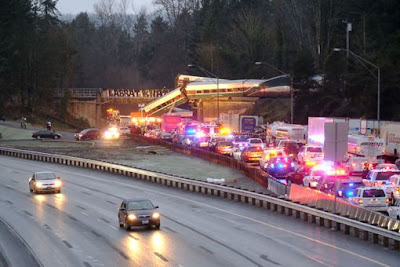 Authorities confirmed there have been a 'number of fatalities' after the train crashed in Dupont as it travelled between Seattle and Portland in rush hour, at around 7.45am local time. US media reports suggest that the majority of travellers - more than 70 of 77 passengers and five crew on board - have been transferred to hospital with "major injuries". 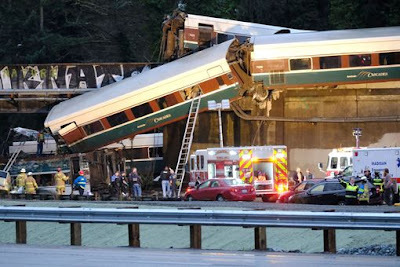 Emergency services battled to rescue several trapped on carriages. 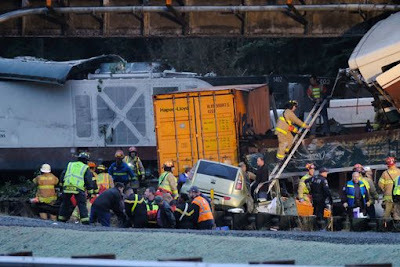 Dramatic pictures from the scene show part of the train hanging from a bridge onto Interstate 5 where it struck vehicles - but no motorists were killed in the crash, it's reported. 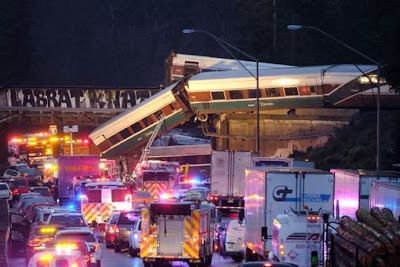 Train 501 which crashed is now known to have been travelling the route for the first time. It's since emerged there were warnings that there would a fatal accident involving high-speed trains by the local mayor just a fortnight ago. 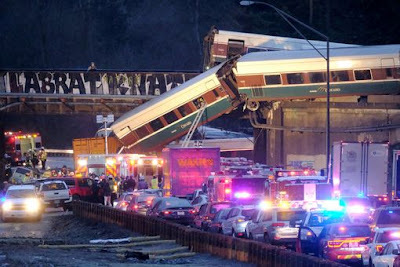 It's still unclear what caused the derailment - but there is speculation that the train 'hit something at 81mph'.